As I am a true Chinese at heart, it was definitely filled with love for all things pork. Pork has been such a centrefold in Chinese cuisine, so much so, none can truly said they had fully tasted Chinese food without sampling its myriads of pork dishes. Just to name a few famous ones are the Char Siew (sweet barbecued pork), Siew Yok (roasted pork), dim sum (all pork varieties), braised pork, pork ribs, pork chop, minced pork atop many dishes, lap cheong (pork sausage), ham and oh so much more. How can I sing praises to good old pork? One way is to present all its glory in series of posts dedicated to it, that’s how. One best way, in my humble opinion, to present pork in all its glory is by singing praises of the caramelized skin to good combination of fat and juicy lean meat with charred skin for the extra texture, mother of all pork – Char Siew. Usually good Char Siew restaurant would ask you to pick between lean, medium or fat meat, which naturally, J and I would pick medium, for me the lean meat lover (oh pork aficionados do not look at me with that eye) and J the ones who revel in the full fat glory. (For the uninitiated, Friday lunches are the epitome of all weekday’s lunches as it usually spans for officially 2 hours (technically more with excuses of traveling) for our fellow Islam friends to do their Friday prayers). It doesn’t matter that I worked about 50km away from THE Char Siew place. It also doesn’t matter that I had to pass two tolls to get there as soon as possible to bite into the said juicy meat. So I grab an unassuming fellow colleague, A, who is also a friend of his and well understanding to our Tham Jiak-ness, flew us at max speed there, while on the way having JC calling us in 10 minutes interval asking where we are, which I can only answer randomly reading out of signboards, which we both doubt he knows where but it is so obvious that he needs to have his Char Siew fix soon, and seating there waiting among tables of it, bathing in its lovely aroma is not helping. About ages later, we got there, and once we sat down and before we can even utter finish “yau fan (oily rice), our table is filled with a big plate of Char Siew and some other lesser accompaniments like bean sprouts, steamed chicken, pork innards and Siew Yok (roasted pork) which could not quite match to its sister pork. The Char Siew here is arguably the best, with the sticky (yet not stick-to-teeth kind) skin, with slight tinge of sweetness, juicy sweet meat and with the right combination of fat and lean meat. Oh boy, thinking of it now makes me want to fly there again on next week’s Friday lunch. But of course not all the time I am so adventurous and crazy as such to travel the distance, yes not even for my beloved Char Siew, and that though had my cravings crying at times during the weekend, was then finally answered by a new found place right in Petaling Jaya itself, what more a few stone’s throw from my place – Famous Seremban Favourites restaurant! Many bloggers had already sing praises to its Char Siew, and I had been hankering to go for a while, and finally one day, it was J itself that initiated for us to go there as he had a recommendation from a fellow colleague, have I not mentioned that this place was famous? So we head there in glee one Saturday noon, and were immediately greeted by rows of yummy looking Char Siew hanging at the stall. But do not try to head to the stall and order like the usual hawker ways, the ordering is apparently restricted to boss, which is frantically trying to serve everyone by taking orders and claiming the bill all at once. To be honest, at times it was a bit frustrating trying to flag him down to get orders and also to pay up. If you are willing to stand the slow service and have an arm that does not tire from waving and with a heart steeled with love for Char Siew, then I definitely recommend this place for PJ folks who want to enjoy a good yummy Char Siew. 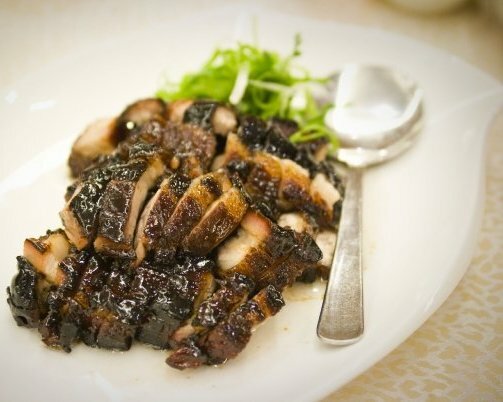 The skin is definitely charred to perfection, too sticky at times, and could be quite sweet so do be careful of dousing on the extra Char Siew sauce, combination of fat and lean meat which we ordered are the just right and juicy with the so famously quoted melt-in-your-mouth sensation. J and I had few times re-ordered in one seating as we could not seem to have enough of the Char Siew, which brings more pain to both parties due to the slow service and lack of help. Thus on subsequent visits, we tried to cover everything in one order. Also take note that they run out of Char Siew real quickly, once we arrive slightly after one and got disappointed as it had ran out and we had to make do by eating the other usual lesser accompaniments of steamed chicken, siu kao (this was not bad actually with generous filling), Hakka mee (worth a mention that it was among the best in PJ) and kon-lo lou shi fun (dry toss rat-tail noodle). As for the last place worth a mention was actually the Char Siew in Restaurant Overseas, which I had a chance to try in a recent visit for a Chinese New Year dinner with fellow ex-colleagues at its Jaya One branch. I was seemingly excited for this dish, amidst all the other delicious sounding orders, and my heart nearly stopped when the waitress return to say that the roast pork we ordered ran out of…Siew Yok, oh no problem then, please bring the a plate FULL of Char Siew. It was indeed a blessing in disguise, the Char Siew was also delicious with slight mixture of fat to its juicy lean meat, charred skin and not the sweet kind yet still retain the pork’s natural sweetness. I would have come back again for its Char Siew but I could not say the same for the rest of the dishes, thus finding it hard to warrant a revisit. If I ever get to have a nice sit-down dinner again at this place, I would certainly order a plate full of Char Siew again. There you all have it, the best of the best Char Siews in KL and PJ, recommended by this Tham Jiak. If any of you do have any other good recommendations for Char Siew do let me know! I am more the willing to indulge in more! Praise to the pork!